Whether you are expanding your boarding operation or starting afresh with the first horse barn on your property the possibilities for barn design and style can be overwhelming. The center aisle is extremely popular with horse owners as it provides an extra space to tack up and groom horses out of the winter weather and hot sun. Considerations of the use of the structure, size and layout of stalls and ancillary rooms for tack and feed supplies, choice of fixtures and fittings, budget and timelines all contribute to the important decision of what to build. 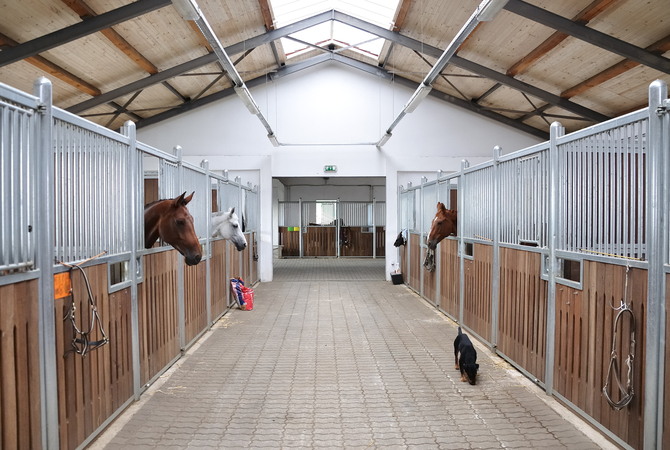 One of the most versatile and most desired options in style is the High Profile horse barn, and there are many good reasons why. Any modular horse barn offers horse owners an efficient and fast building option with a guaranteed dollar figure for the build and can incorporate customizations at the outset that make sense for individual needs and wants. That’s a great place to start and one you can definitely ‘build from’ in the purchase of an ideal horse barn. The High Profile barn developed from the traditional monitor barn style. The center aisle concept is extremely popular with horse owners as it provides an extra space to tack up and groom horses out of the winter weather and hot sun. Stalls can be easily converted to wash stalls and grooming spaces, and all horse care duties such as mucking out and feed/water can be addressed with minimum walking back and forth. The drive-thru concept makes mucking out with vehicular transport help from a cart or tractor easy, and horses can be secured inside without outside access in times of extreme weather such as hurricanes. Everything neatly organized in one space saves time and energy. The change in roof design from the monitor barn to an A-frame design, means there are more headroom for the stalls and better ventilation. It also provides the option to extend the loft space above the stalls. Hinged door access from hay stored above means a no-mess feeding system as hay can be dropped into the stalls below without marching hay bales up and down the aisleway. When you have a four stall barn this may not seem like a big deal, but when you have 20 stalls with hungry horses to feed from the aisleway you can expect clean up to take a lot of sweeping. Today considerations such as type of hay utilized mean the addition of the loft space may or may not be of help for hay storage. Obviously large round or large square bales will too heavy and cumbersome for storage through to the mall or loft above the stalls. There are many pluses and minuses to use of a loft space for hay storage. Fire risks, allergies from dust above, rodent invasions, the labor required to stack the hay, may offset the benefits of having all the hay supplies ready to drop down into stalls below. Of course, lofts can be used for many purposes other than hay storage, such as possible conversion to living spaces with a deck or balcony at the gable ends, tack and equipment storage etc. Many horse owners opt to purchase a High Profile barn without a loft, and enjoy the interior open space and improved flow of air throughout the structure. The High Profile barn can be designed with and without an overhang, which adds protection from the driving rain and heat of the sun for the stall occupant and increases ventilation throughout the building if outside Dutch doors are incorporated. And we all know how much horses benefit from fresh air and the view that keeps them occupied doesn’t hurt mitigate stall vices from boredom either. From the exterior the High Profile horse barn offers a house-like design that can mirror the style of the home on the property and blends into the architectural design of the farm. Their height can be an imposing statement and highlight the importance of the horse aspect of the property. In areas of high snowfall, the increased pitch necessary to meet snow load requirements is easily kept in perspective to the overall size of the building. The High Profile horse barn offers the height of practicality. When barn building it is always prudent to consider not just your needs now, but also possible future needs of the structure and even resale value and appeal. 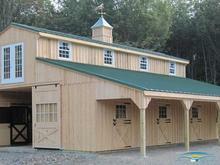 Choose a building company that offers all styles of barn builds. Their wider selection and wealth of experience constructing the various designs will translate into great ‘insider’ tips and information to help you stay on track with both your budget and style of your new barn build. With a modular building company you can purchase the ‘whole kit and caboodle’ in one place saving delays, cost overruns and construction site noise and mess. This article is brought to you courtesy of Horizon Structures Inc., Atglen PA – Modular horse barn and indoor riding arena specialists. Horizon Structures also offers both residential and commercial kennels, coops, multi-use structures and playsets. Please visit https://www.HorizonStructures.com to learn more. About Horizon Structures: One horse or twenty, there's one thing all horse owners have in common...the need to provide safe and secure shelter for their equine partners. At Horizon Structures, we combine expert craftsmanship, top-of-the-line materials and smart "horse-friendly" design to create a full line of sheds and barns that any horse owner can feel confident is the right choice for their horses' stabling needs. Horizon Structures also sells indoor riding arenas, chicken coops, dog kennels, 1 and 2 car garages, storage sheds and outdoor living structures. Headquartered in South-Central Pennsylvania, Horizon Structures, LLC is owned by Dave Zook. Dave was raised in the Amish tradition and grew up working in the family-owned shed business. He started Horizon Structures in 2001 in response to an ever-increasing customer demand for high quality, affordable horse barns. About Nikki Alvin-Smith: International and national published freelance writer and photographer in such world renowned publications such as The Chronicle of the Horse, Horse and Hound, Dressage and CT, Warmbloods Today, The Horseman’s Yankee Pedlar, Reiter, The Equine Journal, Spur, Hoofprints, Horsin’ Around, Horses All, Field & Stream, Western Horse and Gun, Pony Quarterly, Horses All Canada, Catskill Horse to name a few. Ghostwriting, blog services, PR/Marketing copy either direct with manufacturer or for agencies, copy editing and editor services also available. Nikki also produces catalog copy, white papers, e-books, corporate brochures and advertising copy for international corporations and PR/Marketing for celebrities. As a Brit who has called the America home for the past 34 years, Nikki brings a unique perspective to the equestrian world. Nikki is also an accomplished Grand Prix dressage trainer/competitor, competing at international Grand Prix level to scores over 72% and is a highly sought clinician offering clinics worldwide. She has been a horse breeder/importer of warmblood and Baroque breeds for more than 25 years. Together with her husband Paul who is also a Grand Prix trainer, they run Willowview Hill Farm, a private dressage breeding operation and training yard in the beautiful Catskill Mountains of New York. Please visit https://nikkialvinsmithstudio.com/ to learn more about her affordable services. As a Brit who has called the America home for the past 34 years, Nikki brings a unique perspective to the equestrian world. Nikki is also an accomplished Grand Prix dressage trainer/competitor, competing at international Grand Prix level to scores over 72% and is a highly sought clinician offering clinics worldwide. 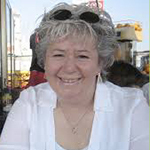 She has been a horse breeder/importer of warmblood and Baroque breeds for more than 25 years. Together with her husband Paul who is also a Grand Prix trainer, they run a private dressage breeding operation and training yard in the beautiful Catskill Mountains of New York.